What a day! Hour+ drive to the Rescue Ranch this morning; something over six straight hours of instruction with Da Boss; a quick burger and fries at the gas station; hour+ drive to my barn to spend 2 hours with my guys. I’m EXHAUSTED. Wow…. The rest of the story: It was a humbling experience at the Ranch today. Fascinating, but humbling. We’re on Day Two of the first block of the apprenticeship program, which I’m taking this spring. Each of us students was to approach a horse in a stall, halter it, flex it, lead it around in the stall, and remove the halter. Sounds easy, right? Not one single one of us students thought it was easy. Looks that way when Jay does it, but when WE get in there? Suddenly, with six pairs of eyes on you and a horse that you don’t know, everything you have learned goes right out the window. I was in the same boat as everyone else. I really don’t think Jay believed me when I told him that I do NOT know, nor do I pretend to know, how to do this properly. What he forgets is that it’s been more than two years since he tried to teach me that skill, and since then, I bet I can count on the fingers of one hand the number of horses (other than my own) that I’ve taken out of a stall. My horses are all pastured, anyway, so I don’t even get to practice on them. Once a horse is OUT of its stall, I’m just fine. But…getting him there? During all the months I worked with Jay developing the apprenticeship program, I never actually got completely over my fear—it’s more than a bit scary to encounter a horse in a 12 by 12 stall. And I’m still a little nervous about the idea. So when my turn comes, Jay says, “You ready? Talk us through it.” Yeah, right. OK. 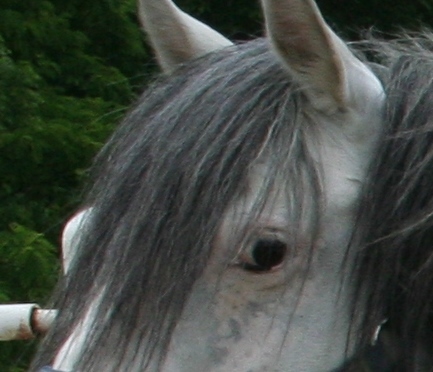 So I pick this little white pony with a gray mane and tail and a face that only a mother could love (I may be exaggerating a bit). And then I totally—TOTALLY—misread everything the pony has to say. Every mistake in the Beginner’s Book of how NOT to approach a horse. It was not pretty. My first clue was when Jay said, “If I were you I wouldn’t have gone in there just yet.” Oh, great…. The good news is that I did not get kicked or bitten, and I did get the halter on the horse’s face. But Jay intervened (one million thanks, Boss!) before I had to flex the little beggar…I mean, the little pony. Wow. I knew I wouldn’t be the greatest at it, but I had no idea I would be that bad, either. I have no excuse other than distraction and lack of focus on my part. It wasn’t the pony’s fault—he was absolutely clear in his communication, if I had been able to read it. The other good part, though (and I actually have to give myself credit for this), was that I did not dissolve in tears or get overly embarrassed by it. A little bit…and a little bit angry with myself. But really, if I never make a mistake, how the heck am I ever going to learn? So I am learning and growing, and developing a better ability to laugh about this kind of thing and get on with the learning. So after six straight hours of instruction and working with the rescued horses, I head to my barn to work with my own horse—on the halter, this time. My plan was to halter him exactly the way I had been shown, right? Practice what I’d just spent half the day supposedly learning. So I get the halter on Galahad with no problem at all…only to realize after the fact that I had done NONE of the steps in the right way. Oh well. Galahad doesn’t know it, and he’s so good and so used to my way of communicating that he’s just fine. But that didn’t stop me from beating myself up about it. I’m sharing this mostly as a kind of baseline measurement: putting the experience into words right after it happened (or six or so hours later, anyway) so that I can remember what it felt like. It’s good for me to remember what it’s like to be an absolute beginner at something—that way, when I’m teaching someone else, I can understand their position better. The other reason, though, is that sometimes when people see me with Galahad, they think I’m some whiz kid horsewoman—but that’s not entirely true. I’m good—but I still have a LONG ways to go. And the only way to get better is to screw up, sometimes royally. Ouch! But hey—like Anne of Green Gables said, “Tomorrow is another day, with no mistakes in it…,” yet. ← I guess I have to believe her….